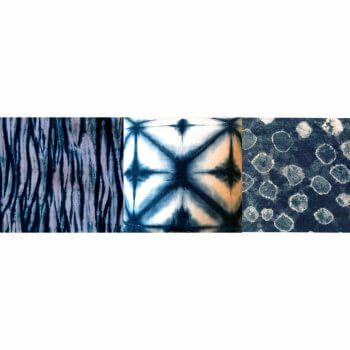 In this three day workshop we will be working with indigo dye on fabric using a variety of techniques to create patterns, including shibori, stitching resists, pole wrapping, and batik. The allure of this dye has captivated cultures and peoples around the world for centuries. It is a thrill to see the transformation of colors as fabric emerges from the indigo vat. You can achieve immediate and gratifying results with the use of this dye. You will also learn how to make your own indigo vat should you want to continue work with this dye after this class. You will end up with some finished pieces of fabric as well as some yardage of beautiful hues and patterns of blue cotton. Sayzie Carr has been working with art and textiles in a variety of capacities for decades, first as a designer for print fabrics, and then as a product designer for the luxury home furnishing industry. Most lately she has been producing hand dyed and printed fabrics to create a line of products for the home. She has been particularly obsessed with using indigo because of it’s transformative properties and the richness and variety of colors that can be achieved. Most recently she has been teaching fiber arts at Bard College at Simon’s Rock. Sayzie is a graduate of RISD, and she has exhibited her work in numerous shows in the NYC, New England and the UK. She currently resides in the Hudson Valley.